The American Registry of Radiologic Technologists (ARRT) offers the Radiography exam for certification purposes. This test measures a candidate’s knowledge and comprehension of the responsibilities that an entry-level staff technologist in this specialized field would generally need to possess. Candidates must meet specific eligibility requirements before taking this test. Every test includes 20 extra questions which are not scored; these are pre-trial items which may be used on future exams. Candidates will not know which items are scored and which are not. The raw score (the number answered correctly) will be converted to a scaled score in the 0-99 range. The minimum passing scaled score is 70. 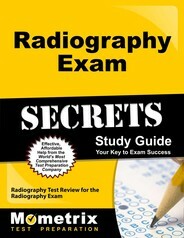 Ace the Radiography test using our Radiography exam study guide with practice questions. 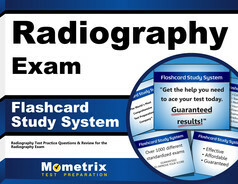 Quickly Solve Difficult Radiography Test Questions with the Radiography Flashcard Study System.